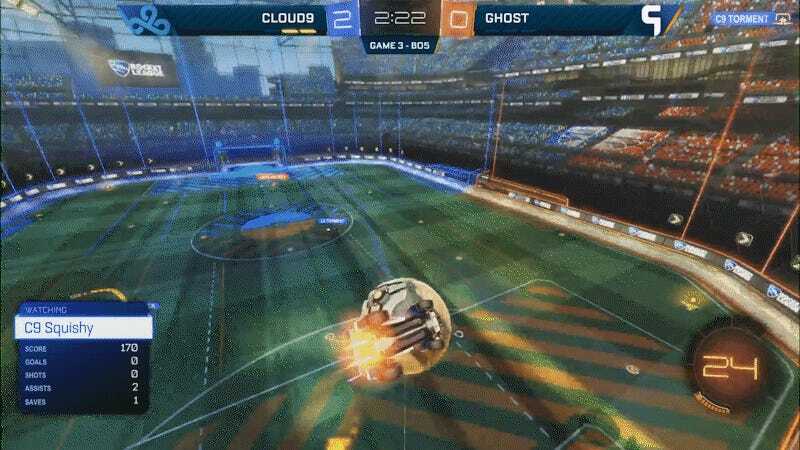 Teamwork makes the dream work in Rocket League, and in a match between Cloud9 and Ghost in today’s championship series matches, all three members got a piece of one goal. After a lob in from Torment, Squishy spikes it down for teammate Gimmick, who knocks it up above the goal and over Ghost’s defender, sending it back to Torment. One tap back down towards the orange goal is all it takes, and in four touches, Cloud9 took a 3-0 lead. Cloud9 would close out the game to take the series 3-0, leaving the team still undefeated in the North American league. You can follow the rest of today’s matches on the Rocket League Twitch channel here.